Coming in as the number one seed on the men’s side, British Columbia’s Male Aboriginal hockey team was looking to repeat as National Champions on home ice. The2017 National Aboriginal Hockey Championships kicked off Monday at the Island Savings Centre in Duncan and both BC’s male and female teams started the tournament hot. Both teams ran through the round robin undefeated at 3-0, winning their groups. The males ran over team Alberta in the quarter-finals setting up a date with Ontario with the winner heading to the gold medal game. Both teams played in the same group and BC defeated Ontario 4-2 in round robin play. The BC females shutout Eastern Door and the North (Quebec) 7-0 in the quarters before facing Saskatchewan in the semis, after Saskatchewan upset Ontario in the first round of the playoffs with a comeback overtime win. On semi-final, Friday three of the four higher seeds fell in defeat, including both BC teams. The males ran into a hot goaltender in Ontario’s Miika Keeshig who stopped all eleven first period shots during the host team’s hot start en route to a twenty-five save shutout in Ontario’s 5-0 win. Quintin Loon-Stewardson had a pair of goals in the win for the Ontarians. The BC females were the second team to fall victim of an upset from Saskatchewan, who started the tournament 0-2 including a 5-0 loss to BC on opening night. Story Navrot opened the scoring for the visitors then added her second of the game mid-way through the third period in what turned out to be the game-winner as the host team was sent to the bronze medal game after a 4-3 loss. The females faced Alberta in the bronze medal game, and it took five periods, but the hosts found a winner at 8:57 of the third overtime period as Camryn Scully scored her second of the tournament to send the Island Savings Centre into a frenzy and clinch third for BC. Both goaltenders were stellar in the 2-1 BC win, as Alberta netminder Josie Leah Cardinal stopped 49/51 and BC’s Jaydlin Spooner saved 40/41 in the win. The males bronze medal matchup was what many expected to be the battle for gold, as both BC and Saskatchewan rolled through the round robin undefeated but both fell in the semi-finals. BC as mentioned fell to Ontario, who they had previously defeated, and the same happened to Saskatchewan. 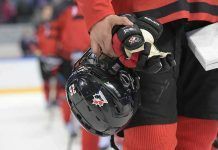 They opened up their tournament with a 5-2 win over Manitoba but then fell to that same squad 4-0 behind a pair of Manitoba goals in the first four minutes. In the third place game, BC jumped out to an early lead and never looked back, Corey Cunningham of Prince George scored a pair in the opening frame as BC went up 3-1 after 20 minutes. Hadyn Delorme added a pair of his own and Cory Loring added a single as BC took home the third place hardware with a 5-2 win. Chad Cromar took home the win, his third of the tourney, and finished the event with the most minutes played, shots faced, and saves. 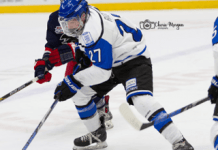 Cunningham finished with ten goals and four assists for a tournament-best fourteen points in six games, one more than the thirteen recorded by Ontario’s Quintin Loon-Stewardson. Duncan born defenseman Ty Brant played big minutes for BC and added one assist, and Victoria’s Taylor Redmond played on the top defensive pairing.